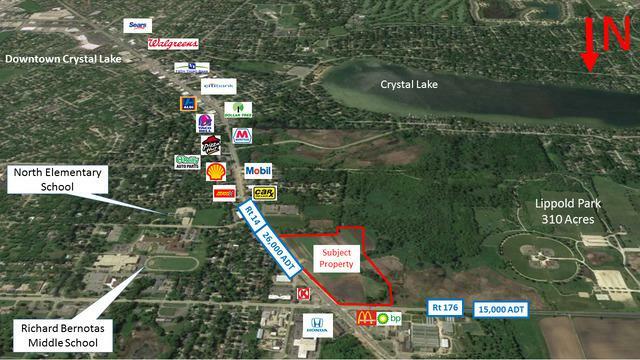 Prime development opportunity on approximately 8 acres at heavily trafficked intersection in desirable Crystal Lake. Southwest corner of the intersection of US Route 14 (Virginia Street) and State Route 176 (Terra Cotta). Can be subdivided. Same owner has additional eighteen acres to the west that can also be developed as commercial retail or Senior Housing. This property shares the intersection with a McDonald's/Citgo Fueling station on the northwest corner and a Shell Fueling station on the southeast corner. Half a mile to the east is the North Elementary & Richard Bernotas Middle Schools. 1.5 Miles to the north is McHenry County College with approximately 7,800 students on a 68 acre campus. Another two miles north is a Centegra 135 bed hospital serving McHenry County.